Research in the Eisenberg laboratory focuses on aspects of inorganic and organometallic chemistry related to photochemistry for artificial photosynthesis (AP) and catalysis related to synthetic methodolgy. All of the research involves collaborative projects with UR colleagues. During the past decade, major advancements have been made in the light driven reduction of protons to hydrogen using organic dyes and semiconductor quantum dots as light absorbers and first transition series metal complexes as molecular catalysts. Proton reduction to H2 is the reductive side of the splitting of water into its constituent elements which is the key energy storing reaction in AP and solar energy conversion into chemical potential energy. Systems of considerable activity and robustness have been developed such as one illustrated below and others highlighted in the papers cited below. 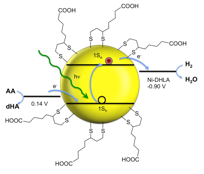 The efforts using CdSe quantum dot photosensitizers with metal complexes are in collaboration with Profs. Todd Krauss and Pat Holland (of Yale). 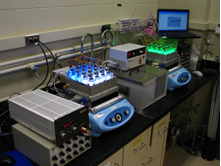 For hydrogen generation studies, locally constructed multi-well photochemical instrumentation based on LEDs (see photo) is used. Other aspects of AP are being examined in collaboration with Prof. David McCamant on the dynamics of electron injection into semiconductor nanoparticles and the effectiveness of integrated systems for hydrogen generation. The use of metal complexes as catalysts for electrophilicly driven reactions has been an important objective in a joint project with Prof. Alison Frontier. Both cationic iridium complexes and a new heterogeneous Au catalyst have been investigated for Nazarov cyclization and subsequent transformations as potential cascades. Sabatini, R.P., Eckenhoff, W.T., Orchard, A., Mulhern, K.R., Watson, D.F., McCamant, D.W., Eisenberg, R. "From Seconds to Femtoseconds: Solar Hydrogen Production and Transient Absorption of Chalcogenorhodamine Dyes," J. Am. Chem. Soc. 2014, 136, 7740-7750. Han, A., Sun, Z., Wu, H., Yan, Z., Jia, H., Zhang, R., Liang, Z, Cao, R., Du, P., Eisenberg, R. "Reversible Mechanochromic Luminescence at Room Temperature in Cationic Platinum(II) Terpyridyl Complexes," Inorg. Chem. 2014, 53, 3338-3344. Vaidya, T., Cheng, R., Carlsen, P.N., Frontier, A.J., Eisenberg, R. "A Recyclable Heterogeneous Gold Catalyst for Electrophilic Chemistry of Polarized Dienones," Org. Lett. 2014, 16, 800-803. Das, A., Han, Z., Haghighi, M.G., Eisenberg, R. "Photogeneration of Hygroden from Water Using CdSe Nanocrystals: The Importance of Surface Exchange," Proc. Nat. Acad. Sci. 2013, 110, 16716-16723. Han, Z., Shen, L., Holland, P.L., Brennessel, W.W., Eisenberg, R. "Nickel Pyridylthiolate Complexes for the Photocatalytic Production of Hydrogen from Aqueous Solutions in Noble-Metal-Free Systems," J. Am. Chem. Soc. 2013, 135, 14659-14669. Eckenhoff, W.T., McNamara, W.R., Du, P., Eisenberg, R. "Cobalt Complexes as Artificial Hydrogenases for the Reductive Side of Water Splitting," Biochimica Biophysica Acta - Bioenergetics 2013, 1827, 958-973. Garcia-Herbosa, G., McNamara, W.R., Brennessel, W.W., Sur, S., Eisenberg, R. "Coordination of Diorganotellurides to Cobalt(III) in Cobaloximes," Polyhedron 2013, 58, 39-46. Eckenhoff, W. T., McNamara, W. R., Du, P., Eisenberg, R. "Cobalt Complexes as Artificial Hydrogenases for the Reductive Side of Water Splitting," Biochimica Biophysica Acta - Bioenergetics 2013, in press. Han, Z., Shen, L., Holland, P. L., Brennessel, W. W., Holland, P. L., Eisenberg, R. "Nickel Pyridylthiolate Complexes for the Photocatalytic Production of Hydrogen from Aqueous Solutions in Noble-Metal-Free Systems," J. Am. Chem. Soc. 2013, in press. Han, Z., Qiu, F.; Eisenberg, R., Holland, P. L., Krauss, T. D. "Robust Photogeneration of H2 in Water Using Semiconductor Nanocrystals and a Nickel Catalyst," Science 2012, 1321-1324. Eckenhoff, W. T., Eisenberg, R. "Molecular Systems for Light Driven Hydrogen Production," Dalton Trans. 2012, 41, 13004-13021. McNamara, W. R., Han, Z., Yin, C.-J., Brennessel, W. W., Holland, P. L., Eisenberg, R. "Cobalt-Dithiolene Complexes for the Photocatalytic and Electrocatalytic Reduction of Protons in Aqueous Solutions," Proc. Nat. Acad. Sci. 2012, 109, 15594-15599. Han, Z., McNamara, W. R., Eum, M.-S., Holland, P. L., Eisenberg, R. "A Nickel Thiolate Catalyst for the Long-Lived Photocatalytic Production of Hydrogen in a Noble-Metal-Free System," Angew. Chem. Int. Ed. 2012, 51, 1667-1670. Du, P., Eisenberg, R. "Catalysts Made of Earth-Abundant Elements (Co, Ni, Fe) for Water Splitting: Recent Progress and Future Challenges," Energy Environ. Sci. 2012, 5, 6012-6021. Eisenberg, R., Gray, H. B. "Non-innocence in Metal Complexes: A Dithiolene Dawn," Inorg. Chem. 2012, 50, 9741-9751. McCormick, T. M., Han, Z., Weinberg, D. J., Holland, P. L., Eisenberg, R "o The Impact of Ligand Exchange in Hydrogen Production from Cobaloxime-Fluorescein Photocatalytic Assemblies," Inorg. Chem. 2011, 50, 10660-10666. McNamara, W. R., Han, Z., Alperin, P. J., Brennessel, W. W., Holland, P. L., Eisenberg, R. "A Cobalt-Dithiolene Complex for the Photocatalytic and Electrocatalytic Reduction of Protons," J. Am. Chem. Soc. 2011, 133, 15368-15371. Lazarides, T., McCormick, T., Wilson, K. C., Lee, S., McCamant, D., Eisenberg, R. "Sensitizing the Sensitizer: The Synthesis and Photophysical Study of Bodipy-Pt(II)(diimine)(dithiolate) Conjugates," J. Am. Chem. Soc. 2011, 133, 350–364. Sabatini, R. P., McCormick, T. M., Lazarides, T., Wilson, K. C., Eisenberg, R., McCamant, D. "Intersystem Crossing in Halogenated Bodipy Chromophores Used for Solar Hydrogen Production," J. Phys. Chem. Lett. 2011, 2, 223-227. Vaidya, T., Manbeck, G., F., Chen, S., Frontier, A. J., Eisenberg, R. "Divergent Reaction Pathways of a Cationic Intermediate: Rearrangement and Cyclization of 2-Substituted Furyl and Benzofuryl Enones Catalyzed by Iridium(III)," J. Am. Chem. Soc. 2011, 133, 3300-3303. Vaidya, T., Eisenberg, R., Frontier, A. J. "Catalytic Nazarov Cyclization: The State of the Art," ChemCatChem 2011, 47, 7989-7991.